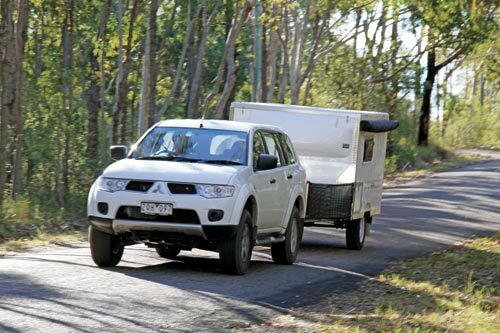 Refining a new style of camper trailer takes grit. The process often involves incorporating new features, materials and techniques, not to mention fine-tuning things that work and doing away with those that don’t. But John Blackborrow of National Campers is committed: he says he’s on a winner with his toy hauler concept and has carried it forward in leaps and bounds with the release of the National Campers Hermit. 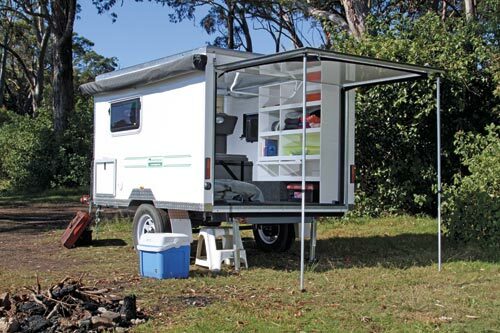 The Hermit’s predecessor, the Toy Hauler, gave camper trailer enthusiasts the ability to securely transport items like motorcycles, bikes or even animals within a large internal space accessible by a fold-up rear door. Customers loved the idea and the response was good, but as with many first-generation innovations a plethora of excellent suggestions came to the fore soon after the Toy Hauler hit the market. Combining his own experiences with that of his growing customer base allowed John to rejig the design. John originally developed the Toy Hauler to hasten pack-up times and improve on storage compared with traditional fold-over designs. The Hermit retains the box-like structure for transporting the ‘toys’ like its predecessor but uses new materials for the body and features a pop top, which easily swings up on two internal handles. In spite of these changes, the local manufacturer kept a firm eye on the bottom line and the Hermit — retailing for $22,500 (shown) — remains competitive with entry-level hardfloor designs. The body is fashioned from a bonded, fiberglass honeycomb sandwich panel for greater strength and improved presentation. The new shell also provides great thermal properties and is lighter as it has no internal frame, while also minimising rust and corrosion. 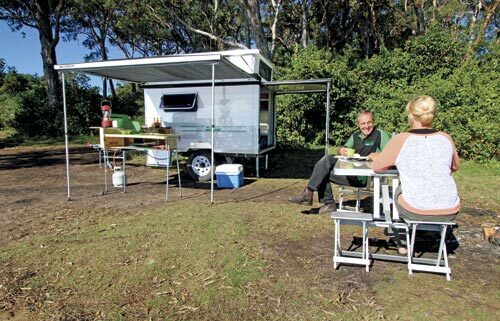 As National Campers is a boutique manufacturer, virtually every aspect of the design is negotiable. 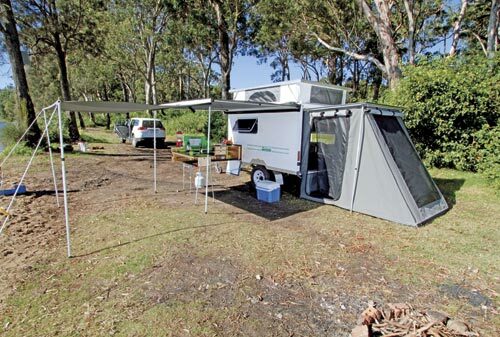 Our review trailer measured 2440mm long x 1500mm high due to the brand of sandwich panel used, but National Campers has relationships with other suppliers and the dimensions can be much bigger. 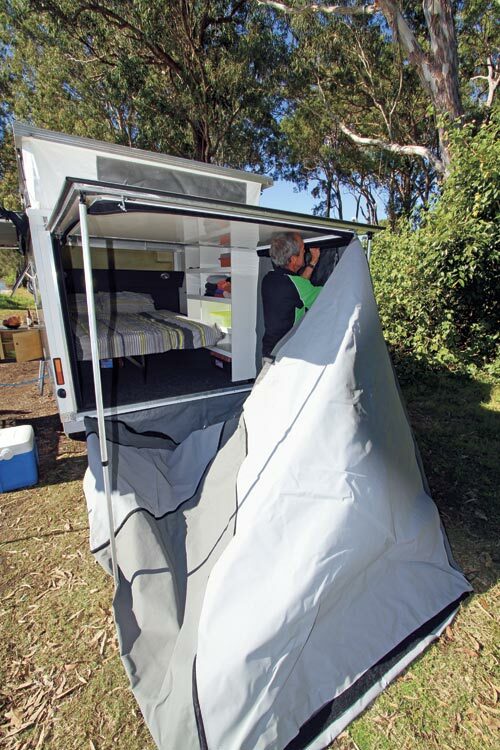 The review camper’s internal width is set to 1900mm to maintain visibility with standard vehicle side mirrors. The top front of the main box features a fiberglass nose cone. Small trucks use these to improve fuel consumption, aerodynamics and stability. The space provides room for a handy carpeted shelf, which is great for soft items such as bedding, clothes, and towels. Although predicated on the capacity to carry ‘toys’, the Hermit offers pleasant internal living. The layout, as shown, features a single bed along the left, which converts to a double by placing a second carpeted base onto supports on the right. Two single foam mattresses can stay made up for travel if you’re happy to forgo the walkway/toy storage area on the right. 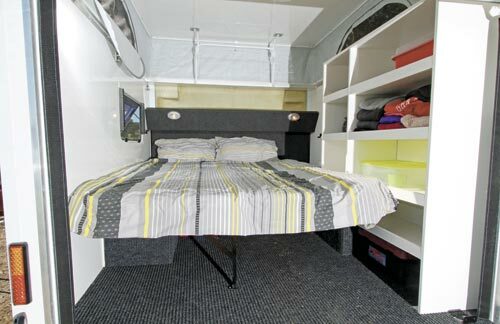 The floor-to-ceiling shelves provide plenty of handy storage and carrying capacity, and the interior is lit by a large, single LED unit inside the rear door and two reading lamps above the bed head. Layout options vary exponentially and can include drawers under the bed, more shelving or even full-height robes. Access to the interior is via the swing-up rear door. The review model has no gas struts to hasten setting up the annexe but many customers have asked for them to be fitted externally, so future versions will probably include struts as standard. The door was, nonetheless, very light and easy to lift and held in place by two drop-down extendable aluminium supports. There was an LED light under here, too. 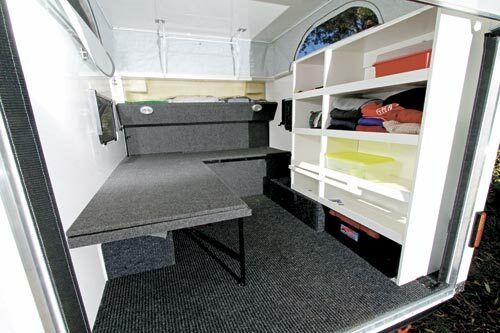 The camper as reviewed has a carpeted bench across the front over the slide-out kitchen but a simpler side fold-out kitchen is available for those who wish to use the Hermit for transporting motorbikes. The pull-out Drifta ply unit — a DPOR model — has a large (450x1050mm) return. The Laminated covered ply kitchen features two drawers, a cupboard and shelves, and a pull-out slide for the sink below the two-burner stove. The stove isn’t ‘plumbed’ so you need to connect the gas bottle from the drawbar as you set up camp. In a similar manner, you need to connect the manual water pump to the 120L water tank to make full use of the kitchen. 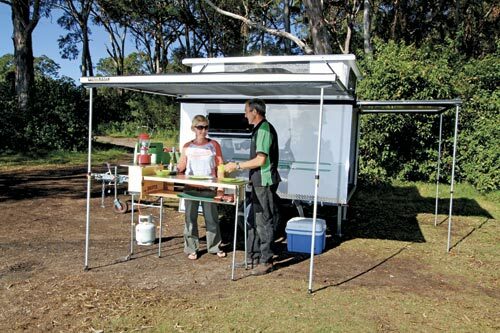 Over the kitchen is a 2500x2000mm roll-out Stand Easy awning, which comes with an outer end wall that can also lift up for an extra 2m of awning space. Awning side walls are also available to enclose the area. 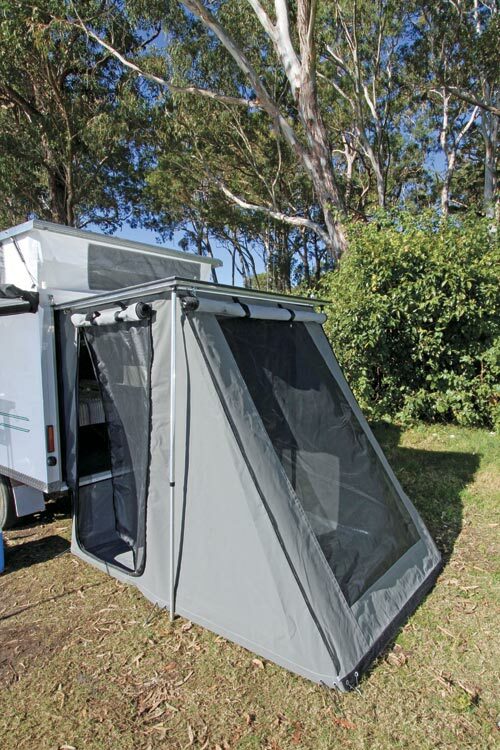 An additional awning is available for a child’s sleeping quarters or shower room on the driver’s side. At the rear, a simple annexe attaches under the fold-up door to provide a 2400x1700mm floorspace; this can sleep two children or be used for extra living space for two adults. It has a roll-up rear window and zip-up doors on either side, all with midge screens. 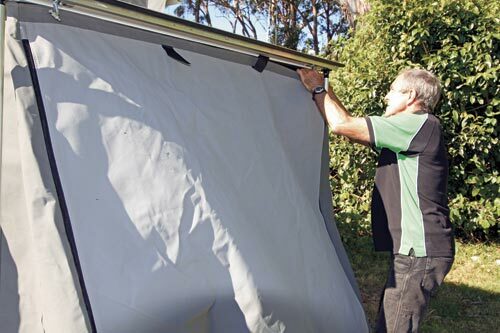 The annexe is made from 15oz Aussie canvas as John is a big supporter of Australian manufacturers. Personally, I think it would be easier to handle if it was made from 12oz canvas; John admits this is another likely change. As is, the annexe took only a couple of minutes to attach. The long drawbar provides room for up to four pushbikes. It carries two jerry cans and two 4.5kg gas bottles plus a large aluminium storage box and an Al-Ko offroad hitch. Offroad performance is enhanced by the longer automotive five-leaf and shock-absorber suspension designed for light trucks; it all rides on a 45mm beam axle. The spare travels under the trailer on a winch set-up. The brakes are inertial drums. The electrical set-up includes a 105Ah battery carried in a battery box in the front box, with a 7A charger. I feel the latter is a bit small for such a battery but it’s easily optioned up. Inverters, 240V circuits, battery monitors, solar and other items are all optional. As I saw it, the Hermit weighed in at a modest 720kg (with a gross loading of 1350kg) with an excellent 55kg of drawbar weight when empty — a significant advance on the original model. The flexible design makes it suitable for many purposes and for a wide range of customers. 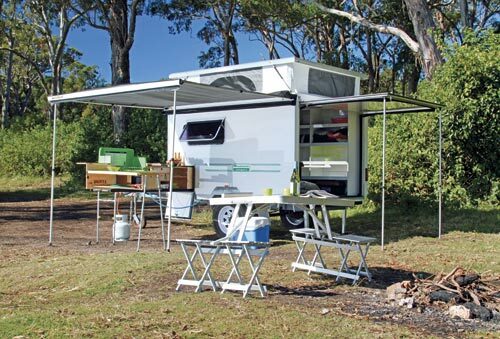 With an all-Aussie design and construction, the Hermit retails for $22,500, offering good value for money. It gets my tick of approval. Find National Campers for sale. Search for new National Campers.